Part of surviving in the suburbs is making sure we get enough coffee to drink, otherwise we're goners. I used to get by on water and other useless liquids until Darling Bride got me addicted to whatever chemical is in Starbucks coffee. Now we try to keep alive without the expensive Starbucks tab. Costco Sumatra. One day, Darling Bride sent me to get coffee with the instructions "coarse ground for French Press." I might as well have been reciting random gibberish. 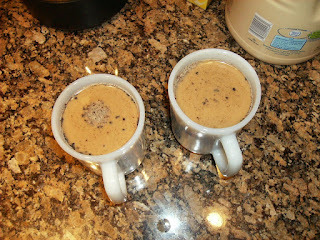 Fast forward to today, and our beloved coffee press is so overused that our morning drink also comes crunchy. So today we are beta testing the grandparents' PERCOLATER! Darling Bride found instructions on the internet. We have her grandparents' old percolater pot. This might sound like something of the 1950s, but we are on our way to a richer, fuller, authentic coffee experience. We do have a modern coffeemaker with the timer, drip, and so on, but it's not the same. And to think I wasn't even a coffeedrinker when 2009 was beginning. It wasn't even a New Year's Resolution! Here goes. Add the water, add the coffeegrounds to the little container, and...oops! Coffeegrounds got into the water. Well, let's see what happens. Plug it in, and watch the water turn into coffee in the little dome on top. It turns off automatically. Much too weak! At this point we are too frustrated to take another picture. 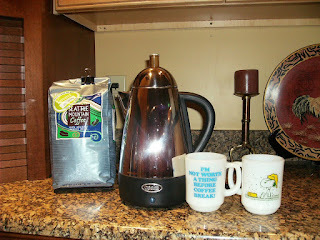 Off to Starbucks tonight to get another French Press to replace our broken one. Final Score: Suburbs 2, Man 0. Better luck next time. Funny. I hate to admit defeat, but I will when it is obvious. Thanks for wanting to try, anyway. When you are NOT desperate you might check on parts for your French press. Tends to be cheaper than buying a new one. Coffee is an absolute necessity around here. Must keep the wife happy.